As many of you know, my husband is an early bird. He is the one up and at work by 7 and even working from home he is usually online by 7:30AM. So after a lot of late wake-ups in Turkey, we set an alarm and got to the Egyptian museum by 8:30 AM, well before the 9 AM opening. So, we got a chance to look around the grounds where you can take pictures, there is a burned out building right next to the museum that is a reminder that the protests were not that long ago. You can tell in many areas that tourism and all of those that have made their living with tourism have taken a large hit to income. As tends to happen in Egypt everyone wants to tour you around, help you out, etc. and get tips for it. So, I have to admit that I was a little annoyed when this tour guide followed us around an didn’t take no for an answer, but we agreed to a 1 hour tour where he would show us the highlights of the museum. Right at 9:00 AM when the museum opened, it became well worth it to have a private guide amongst the mass of tour groups that came in at the same time and the vastness of this museum. They didn’t allow pictures inside, so I hope this is a good description. It is in some ways like your grandfather’s attic where things are arranged and some things are labeled and in boxes and well protected and other things are just laying there, not protected by any kind of glass or in exhibition cases. Some of this is in preparation for the new museum that will open in Giza in 2012 and others are because the Egyptian government has made a huge effort to get their antiquities back. Some of the items had labels that clearly indicated that item was repatriated from the Metropolitan Museum of Art, others that this was found up for auction on the Internet. It is hard to explain the vastness of what you can see. There are basically whole pyramids, temples and tombs that were excavated and the contents are now in the Egyptian museum. They have so many sarcophagi that you almost get bored and jaded by seeing just another sarcophagus or coffin as most people had 3 or 4 of each that nested inside one another. One of the most amazing parts was the Tut Ank Amun room. Since we had a private guide, it was just me, Earl and a single guard in the room with King Tut’s head and gold, lapis, turquiose, and red quartz and the pure workmanship. These were in glass cases, but we could get within about 4 inches of the surface of these items. It was truly amazing. 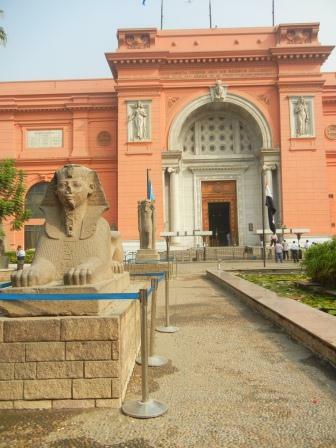 Since many of these things are only guarded by a single guard, there were some areas where the tour guides were not allowed to go, the jewelry rooms, the mummy rooms (extra admission charge) and the Tut Ank Amun (King Tut) room. We learned a lot about the different materials used in the various locations. Around Giza, and Saqqara (Sakkara) the tombs and sculptures are mostly sandstone and limestone. In Luxor, almost everything was carved from rose granite. And many of the items were sculpted from single huge pieces of stone. Alabaster was used to store the organs, and linen used for the mummies, since cotton was not discovered until later. The mummy rooms were fascinating and were one of the few areas in the museum that was actually fully air-conditioned. You had to pay extra for entry, but you actually saw the mummies in their linen bandages, learned that the royal mummies were positioned with their arms crossed and that they have been continuing to do DNA work in order to identify some of the mummies found, as many were moved around 1000 BC to different locations. I have to admit it was a little creepy looking at those whose protection at one point was so important that they were encased in huge stone temples, sarchophagi and 3 to 4 different coffins. They also had preserved animal mummies, including a huge preserved crocodile that was probably 12-14 feet long. The pharaohs needed everything in the afterlife as they needed in life, including ancient tweezers, protective idols and armies, weapons including bows and arrows and chariots. So you really got the idea of what technology had existed between 3000 and 1000 BC. Our 1 hour tour turned into about a 2 and a half hour tour and we definitely could’ve stayed for much longer, but as is the custom here, although hard to get used to is the requisite visits to “shops”. So we survived the walk across the 8-lane (10-lane if you are an Egyptian driver and don’t pay a lot of attention to the actual lines on the road) to a papyrus and perfume shop. We did buy some pretty cool things for souvenirs and gifts and learned how they make papyrus and why it holds up so well. Fundamentally, the sugars in the papyrus plant help create its own glue that will hold it together. They then paint on it with vegetable-based dyes. The perfumes that are made are basically just pure essence or essential oil (as is the norm for most perfumes in the Arab world), where they do not add alcohol or use with any type of atomizer. That visit also allowed us to arrange for the trip to the pyramids, Memphis and Sakkara for the next day and the transition from the Conrad to the Hilton Great Pyramids Golf Resort with our guide. Once we were done with this adventure we took another exciting Egyptian taxi ride back to the hotel, where we hung out until we decided to get dinner at the hotel restaurant, do some more planning for the future spots and get ready for tomorrow. Jeanette…I love reading your blogs! We all feel like we are with you and Earl on this trip.